Genie Bouchard returns to Canada’s Fed Cup team for the first time since 2015 when it hosts Ukraine at STADE IGA in Montreal from April 21-22. She joins Bianca Andreescu, Francoise Abanda and doubles stalwart Gabriela Dabrowski for the World Group II Playoff against a visiting team whose members will be announced on Wednesday. There’s some doubt, with the WTA Premier event on clay indoors in Stuttgart starting the Monday after the Fed Cup tie in Montreal on hard court, whether the top Ukrainian players – No. 4-ranked Elina Svitolina and No. 41 Lesia Tsurenko – will participate. The 15-year-old prodigy Marta Kostyuk, who upset No. 26-ranked Daria Gavrilova of Australia in Fed Cup in February, is not expected to make the trip to Montreal. In that February first-round World Group II tie in Canberra against the Aussies, none of the six top-ranked Ukrainian singles players showed up. But that’s unlikely to happen in Montreal with a demotion to zonal competition for 2019 on the line. Bouchard is in line for a singles spot on the Canadian team along with Andreescu and Abanda. 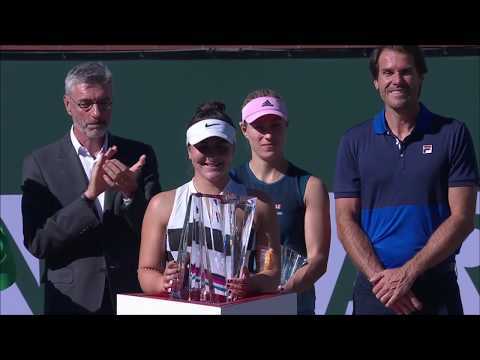 Andreescu has reached the finals of two ITF $25K events in Japan the past two weeks, was Canada’s best player in a 3-0 loss to Romania in Cluj-Napoca in February and played impressively – beating No. 51 Yaroslava Shvedova – a year ago at age 16 in Montreal in a World Group II Playoff versus Kazakhstan. As for Abanda, she has not performed well of late but last year defeated both Kazakhs – Shvedova and No. 31-ranked Yulia Putintseva – to lead Canada to victory in Montreal, her hometown where she always tends to play well. Projected to rank No. 113 or slightly lower at the entry date for the French Open next Monday (April 16), Bouchard is on the borderline for making the main draw cut-off of No. 108 – although it can vary depending on withdrawals and lower-ranked players using injury-protected rankings. If she misses, it would end a streak of 20 consecutive Grand Slam singles main draws and result in her having to play qualifying for this year’s Roland Garros. It’s unfortunate because if she had won just one more round in most of the tournaments she has played this year, she might well have been inside the cut-line. Wimbledon’s main draw is also in jeopardy for Bouchard because she has to defend points from her success last May in Madrid where she beat Alizé Cornet, Maria Sharapova and Angelique Kerber before losing to Svetlana Kuznetsova in the quarter-finals. She got 215 points and needs to defend them and a bit more to be able to meet the Wimbledon entry deadline of May 21. Bouchard has split with coach Harold Solomon (above on left with hitting partner Robbye Poole) and was recently in Los Angeles working with the legendary Robert Lansdorp, an 80-year-old who has mentored Grand Slam champions Tracy Austin, Lindsay Davenport, Pete Sampras and Sharapova among many others. She is working hard and showing the desire and commitment to try to climb back to the top of the sport – she was as high as No. 5 in October 2014. Here’s a video of Bouchard at her post-Errani media conference: credit Scott Eisberg – @SEisbergWCIV in Charleston. Despite the progress made by the 17-year-old Andreescu, the 21-year-old Abanda hovering not far from the top-100 and even a possible return to her former top-40 level by the 27-year-old Rebecca Marino, Bouchard, 24, clearly remains the face of women’s tennis in Canada. She had her greatest success in Fed Cup back in 2013 when she went 4-0 in Group I Americas (round-robin) competition in Colombia before she won one singles and combined with Sharon Fichman for an inspired 6-4, 6-3 doubles win over Svitolina and Tsurenko in the decisive fifth match of a World Group II Playoff in Kiev, Ukraine. A year later, she led Canada to its only appearance in World Group I, going 4-0 in singles in victories at home over Serbia and Slovakia. The only real blemish on her 10-4 Fed Cup singles record came in 2015 at Maurice Richard Arena in Montreal when, ranked No. 7, she lost both her singles to unheralded Romanians Alexandra Dulgheru (69) and Andreea Mitu (104). That was her last appearance in Fed Cup and she will be returning to her hometown next week hoping to inspire both her teammates and herself. She has spent a lot of time practicing at the National Training Centre, where the World Group II Playoff will be staged, and should feel comfortable on the Premier surface hard courts there. At a time when top stars such as Serena Williams, Venus Williams, Victoria Azarenka, Sloane Stephens and Petra Kvitova have had to rebuild their rankings after various kinds of adversity, Bouchard would be in good company if she’s able to get back to where she wants to be. For the fifth time in a row since 2012, Canada has drawn a home tie for the Davis Cup World Group Playoffs – 2012 (South Africa), 2014 (Colombia), 2016 (Chile) and 2017 (India) – and will host the Netherlands from September 14-16. Of the eight nations, home-and-away possibilities in a draw held Tuesday morning at International Tennis Federation headquarters in London, only one was a definite home tie for Canada – Netherlands. There were four definite away ties for the World Group Playoff round – Austria, Colombia, India and Sweden – with three others to be decided by lot – Bosnia-Herzegovina, Hungary and Uzbekistan. Playing Netherlands will bring back memories of one of Canada’s finest hours in Davis Cup – in Toronto at the old National Tennis Centre at York University in September 1990 when it earned its first World Group status with a 3-2 victory over Netherlands. On a chilly Sunday with a smattering of huddled, warmly-dressed spectators in the crowd, Grant Connell of Vancouver completed a tour de force weekend as he defeated both Dutch singles players – Paul Haarhuis and Mark Koevermans – and combined for a doubles win with Glenn Michibata over Haarhuis and Koevermans. The Dutch subsequently defeated Canada 3-1 in 2004 in a World Group first round in Maastricht as Martin Verkerk and Sjeng Schalken went unbeaten against Canadian singles players Simon Larose and current team captain Frank Dancevic. Robin Haase, 31 and ranked No. 44, will lead the Dutch team with a second singles player likely to come from Tallon Griekspoor, 21 and ranked No. 240, Scott Griekspoor, 27 and No. 298 and Thiemo de Bakker, 29 and No. 311. In a 3-1 loss to France away in Albertville in the first round in February, Haase and de Bakker (defeated Adrian Mannarino) played singles and ATP No. 11 doubles player Jean-Julien Rojer combined with Haase in a three-set loss to Pierre-Hugues Herbert and Nicolas Mahut. The match-up against Netherlands will take place the weekend after the US Open at a location to be determined later. It could give new Canadian captain Dancevic an opportunity to showcase Daniel Nestor, by then 46 years old, in a farewell doubles appearance. Going back to his debut in 1992, it would mark his 53rd Davis Cup tie representing Canada. Ken Sinclair, one of the most dynamic executives in the history of Canadian tennis, died on April 3 in Stouffville, Ont., at age 88. A world-class senior player who won numerous International Tennis Federation and Canadian titles – often teamed with fellow senior dynamo Lorne Main – Sinclair was the driving force behind the 1976 move of the Canadian Open (now the Rogers Cup) to the newly-built National Tennis Centre at York University in Toronto. Until then the premier Canadian event had always been played in private clubs across the country and the construction of the new stadium, courts, and offices at York was a significant step in professionalizing the tournament and the national association. It eventually led to the 2004 move across the York campus to Tennis Canada’s current headquarters at the Aviva Centre. Sinclair was inducted into the Canadian Tennis Hall of Fame in 1996 in the builder category. A successful businessman who founded Sinclair-Cockburn Insurance in 1953, he was an exceptional athlete who, even in his 60s, would sometimes play pick-up hockey and tennis on the same day. A man of many involvements in tennis over decades, Sinclair co-founded the All-Canadian (tennis) Academy, was chairman of the Canadian Open from 1969-1983 and publisher of On Court, a Canadian tennis newspaper that yours truly edited from 1986 to 1991. There will be a Celebration of Life gathering for Sinclair at the Toronto Cricket Club from 2 p.m. to 4 p.m. on Sunday, April 22. US Open champion Sloane Stephens, in Toronto visiting her boyfriend Jozy Altidore, a forward with Toronto FC, and Denis Shapovalov attended a Raptors game last week at the Air Canada Centre. They took part in some on-court ‘tennis’ with the team’s mascot. Surprisingly, ‘the Raptor’ actually seemed to have a few clues about how to play tennis during their hit-and-giggle hijinks.